To all our family and friends. Once again we've had a full, exciting and occasionally sad year. In January we had our customary Australia Day BBQ on 26th January. It was hot of course, being mid summer, but we had a garden full of people and we sat out under the stars until very late (ie about 9.30 at our age). In February we fitted solar panels to our Oka, ready for our next outback trek. In March we had a severe wind gust which blew our new glass topped outdoor table across the patio and smashed it into a zillion pieces. Fortunately the insurance company paid for a new one. In April, Scott bought a house about 10 kms away so we were busy fitting stuff to it: a new mail box, replacing window locks, extending his verandah, wiring up his workshop, all the things we didn't have the time for but what parents are expected to do as a matter of course. In May we overhauled the suspension on our Oka. Fitting new suspension bushes means lifting a 6 tonne vehicle safely to remove the heavy springs and is NOT EASY. In April we were invited to a former colleague's 60th birthday party in Moonta, a coastal town about 100 kms up the gulf. It was a surprise event which Mike knew almost nothing about and went off very well. His wife Jill arranged everything including renting 2 houses for the weekend for guest to stay at. We had a ball, but also a sore head the next day. We also had a day trip to Sydney in April courtesy of my QANTAS Frequent Flyer points. We rode the train from the airport across the harbour bridge and did a tour of the Opera House. We hadn't realised it was so complex a structure inside. There were some musical performers rehearsing and the acoustics were quite amazing. In May we went to a 4WD Weekend arranged by our HF Radio Club in Quorn in the Flinders Ranges. This is a magic part of the country and only about 400 kms north of here. Local land owners have opened up their properties and access tracks to visitors. We did 2 very tough tracks which climbed and wound tortuously through the hills for 20 kms or so. We nearly rolled the Oka over on a few hair rising turns but escaped intact to fight another day. Endless talk of our experiences around the BBQs took up each evening. In June we left for another trek across Australia. We met up with some friends in Coober Pedy (1000kms north of here) and drove across the Great Victoria Desert on the Anne Beadell Highway, which is as far removed from being a "highway" as it's possible to imagine, it's just 2 wheel tracks across endless sand dunes and remote, but beautiful desert country. It took us 12 days to cover the 1500 kms and there was only one place to buy fuel and only 3 places where rain water was available. Lucky we are well prepared and fully self sufficient. In July, continuing our trek, we turned north and trundled across yet more desert tracks to Alice Springs and had a good couple of days at Ormiston Gorge with Tim and Brenda, fellow Oka owners from Byron Bay in NSW. It's getting warm now as we head further north into the tropics and meet up with Charles and Fred, our friends from the UK who come out here for a few months each year to see a bit more of the country. We waited in Tennant Creek for their triumphant arrival but then I got a text message to say they had already triumphantly arrived some time earlier, and were waiting for us at the caravan park. We spent the rest of July and part of August travelling with them up to Darwin which is a delightful city but where it was very hot and sticky. While in Darwin we received a very sad message to say that the son of a very good friend had died after a car accident. We were devastated of course but what can you say or do when you're 3000 kms away? We had known George all his life (26 years) and while we can still remember his Christening, we couldn't attend his funeral, and that left us a bit shell shocked for a few days. But then Charles and Fred had to move on to catch flights home and we parted company until next year and we carried on our trek. That took us across the Northern Territory, where had some scary moments with crocodiles, towards the Gulf of Capenteria and to Mount Isa, and from there we headed south across outback Queensland arriving home 2000 kms later at the end of September. We'd been away for 3 1/2 months, covered 14,000 kms, ticked off several other remote locations and revisited some of our favourites. We'd had yet another great trek, but the garden had gone completely feral as you can imagine. So October and November seems to have been taken up with garden and house maintenance. 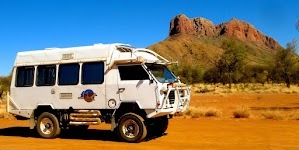 Recently I saw the design of a simple slide copier in an electronics magazine so I was fired up with a desire to relive our experiences on our overland trip from the UK to Australia in 1974/5. So I built it and copied all our best slides from the era into digital format. You can see these at http://picasaweb.google.com/jcribbans. It is kind of scary to see just how young and slim we were then. I made a resolution to go on an immediate hunger strike, right after breakfast. Today, ironically in the midst of both the global economic crisis and pre-Christmas spending rush, we are both fit and well and looking forward to our next years adventures, whatever they may be. For some reason we have been thinking and talking of our long distance friends and relatives more this year than in previous years. Maybe the global crisis has made the world a smaller place. Certainly we are all in the same boat this year and, thinking positively, it can only get better from here? Best wishes to you all for a safe, happy and rewarding Christmas and New Year.